I'm having so much fun with these sketch challenges, so I decided to play along with Taylor's Cupcake Friday challenge. It's a fun angular sketch. First, I started with my current favorite color combination of pink and brown. One day I may get tired of it, but for now it is such a fun combination, and I absolutely can't get enough of it! I pulled out a fun Verve cupcake stamp set that was just begging to get inked up. When I have more time, I'll have to pull this set out again and do some yummy cupcake coloring. It might be hard to tell, but the card is very blingy! This will also serve as my OCC challenge card.. for bling on the bling! Cardstock: PTI; Patterned Paper: DCWV Glitter stack; Stamps: Verve, PTI (sentiment); Ink: Memento Tuxedo Black, Antique Linen distress ink; Cuttlebug embossing folder; Nestabilities; Other: Star Dust stickles, white gel pen, rhinestones. So cute! 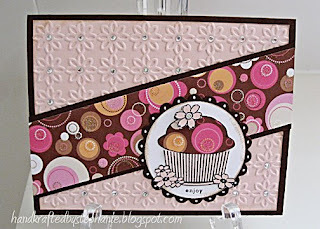 I love the patterned paper you use and your cute paper pieced cupcake! Thanks for playing the challenge! great color combo, love the stamp too! Now this is a beautiful card with some AWESOME Bling!!! I love it and thank you so much for playing! Wow!! This is really gorgeous! Love how you've pieced the frosting, as well as all the gems on the CB'd BG. Fantastic! !